We know you are the game publisher,we sincerely introduce us that we are the maker of wooden toy, board game in China,and always produce OEM products for our customers in different countries,including wood or cardboard materials. If you are developping new products,or old projects,we would like to make the sample and give you our best cost. As funny as it is to read, I still find myself just a little tempted . . . Apparently, someone *accidentally* linked to my box tutorial from whipup.net, a crafting site. I guess they were not too interested in making board games, though, because they didn't leave a single comment. :( And they "fixed" the link, ensuring that no more lost crafties find their way to my blog . . . maybe this is better for all involved! When I started this blog many months ago, I fully intended to sprinkle in a few tutorials here and there. I've just now gotten around to putting one together, but better late than never, right? This one is a good one to start with. Nothing says, "I finally have a real prototype!" like moving all those little bits, cards, rules, notes and boards from old plastic bags to a crisp new cardboard box! 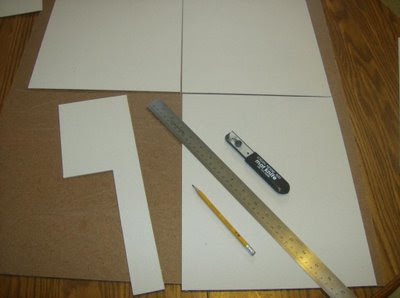 Step 1: Figure out what size box you need and determine the necessary size of the rectangles for your box and cut them out. 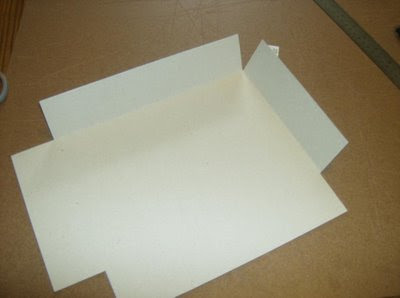 My box is designed to be (close to) the maximum size that can still be covered by a label printed on a single sheet of 13x19 paper (the largest my print shop can do). 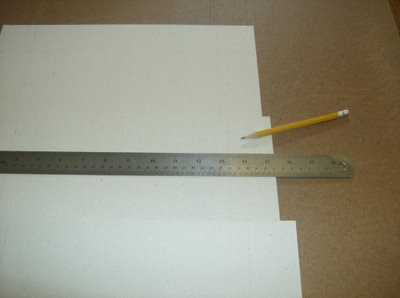 I cut the bottom rectangle to 10 9/16" x 13 9/16" and my top rectangle to 10 3/4" x 13 3/4". 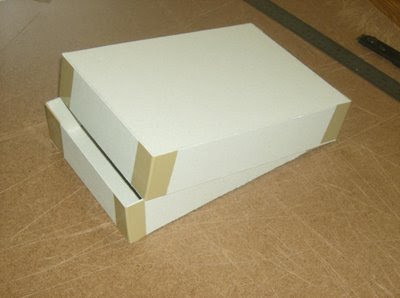 This box accommodates a folded board size of 6 1/4" x 9 1/4". Step 2: Draw a line 2" from each side. This gives the box a height of 2". These lines should make four 2" squares on the corners of the sheet. 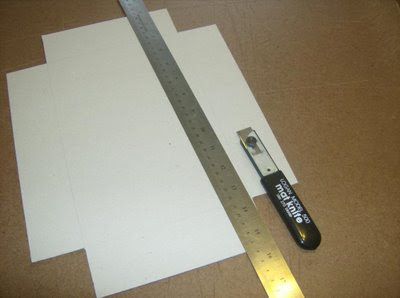 Step 3: Cut the 2" squares off all the corners. I use scissors just to make it quicker. Step 4: Score the pencil lines from step 2 with the knife. 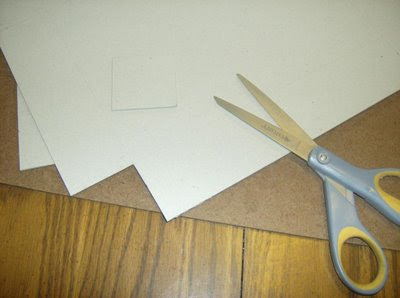 This part can be tricky--you want to cut about halfway through the cardboard. 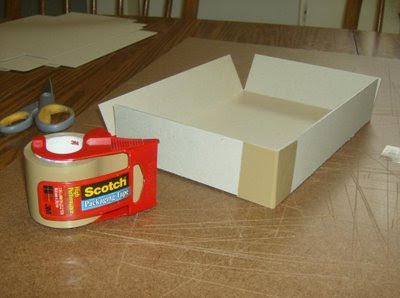 Step 5: Place the sheet cut-side down and carefully fold the sides of the box up. Step 6: Tape all the corners. I use a 2" packing tape which works well when taping 2" corners. I have found this tape to be a bit slick when it came time to adhere the label, but a little glue stick on those areas (just before attaching the label) seems to do the trick. And then you're finished! Check to see that your box top fits well on your box bottom. I'm not including instructions for applying the label just yet, but here's a hint: get some 3M Super 77 spray adhesive. It's like magic. Anyway, there you have it--a brand new box. You'll be all the rage at the next playtesting session. Feel free to ask any questions if something isn't clear. Good luck with your boxes! I just got some new pieces in for a few prototypes I'm working up. I got top notch quality at a fair price from Boardgamebits.com. 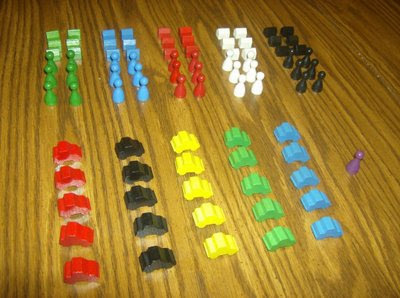 They have some very useful and hard-to-find pieces for all your eurogame needs! This BGG thread just gets funnier every day! Note: Please do not comment on the thread if you actually are one of my "shills." It looks like random strangers might just carry the day. BTW - thanks to any random strangers for watching my back. 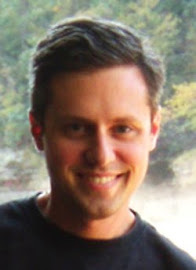 My sources now tell me the game will be released at the beginning of 2009. I guess this sort of thing is to be expected. Still, I would rather they take the time to do it right rather than give it the rush treatment. It also looks like the rule changes are going to stick, but we can still play by the old rules if we want. All in all, SJG seems to be doing a serious job producing a great product. Also, check out the forum action over at BGG! The SJG guys have been hitting the conventions and generating some positive buzz. And I'm being accused of shameless shilling. Some guy keeps whining about the fact that about four of my friends/relatives have rated my game a 10. His world is forever distorted by such underhanded trickery. Really, what did you expect from my parents? "Well, it's an okay game for your first professional release--6.4 seems about right." Give me a break! Quick update: the BGG page now has over 1900 2000 hits and 21 ratings!